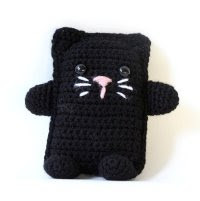 Free Amigurumi Patterns: Amigurumi Rectangle Cat - perfect for a heat pack cover! Amigurumi Rectangle Cat - perfect for a heat pack cover! This cute rectangle cat would make a perfect heat pack for Winter. All you'd have to do is put your wheat inside a smaller fabric bag, then slip that inside the crocheted cat! I love it, really cute!